Each Ion Pedicure Cart comes equipped with a beautiful glass pull-out tray. Choose from either Jamocha or Warm Terracotta glass. Pedicure carts improve your salon's efficiency and are a must have for busy spas. The versatile Ion Pedicure Cart includes two pull-out drawers for convenient storage. Each Ion cart features a tempered glass, pull-out tray of the color of your choice. This great cart also includes built-in wheels to provide easy mobility. 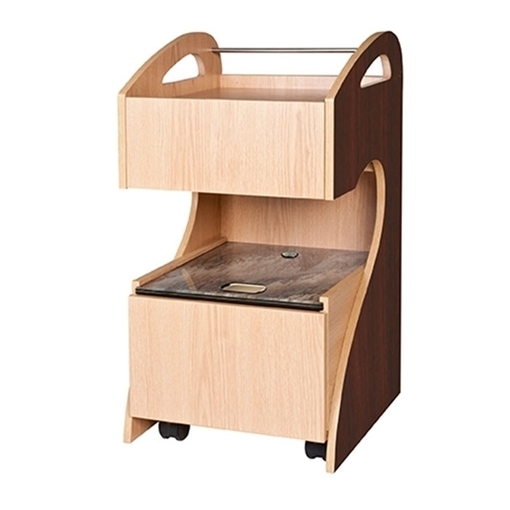 The Ion Pedicure Cart is available in your choice of Oak, Mahogany and Cafelle laminates. For quality assurance, each cart is designed and assembled here in the USA.